Wearing a veil is one of the oldest wedding traditions — and a fun one, too! A few weeks ago, we looked at short and sweet veils, and today, we’re sharing some options for brides who prefer longer, flowy veils. ► Your veil should complement your look, not compete with it. ► Simple gowns will offset any intricate lace or beadwork on your veil. ► Heavily beaded or laced gowns look best with sheer or transparent fabric veils (silk chiffon, voile, or organza). ► A blusher, a single layer worn over your face during procession, can be added to any veil. Now, onto the long veils! Waltz veils (also called the Ballet Veil) normally end between the calf of the leg and the ankle. They’re often worn with a double layer, with a shorter blusher at the front. It’s a beautiful length that doesn’t overpower a delicate or body-hugging dress. 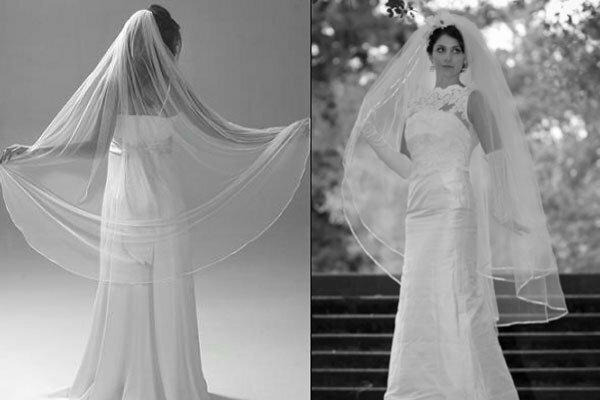 Known as a “Walking Veil,” this was very popular in the 1970’s during the Victorian Revival period. Dress: This style is extremely flattering on a bride wearing a fitted gown, either without a train or with a very short train. Accessories: Choose accessories that are small, dainty and understated. Left to Right: Dessy Gown $410; Flower Hairpins, $38. The terms “sweep veil” and “chapel veil” are sometimes used interchangeably, but sweeps often just brush the ground whereas the chapel extends a few inches on the floor. 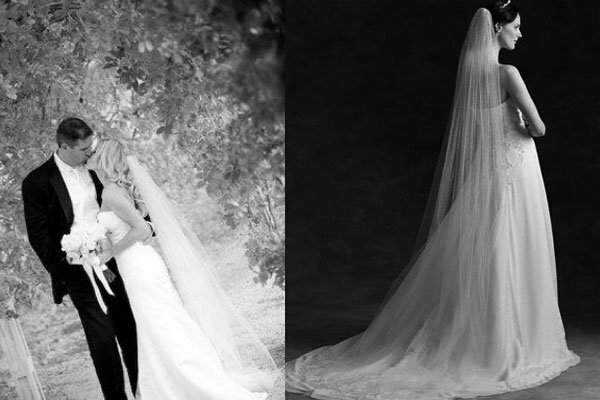 Dress: The chapel length or sweep veil is a great with a flowy gown with a floor-length train. It looks stunning with multi-layered dresses in organzas, chiffons, and specialty fabrics. Accessories: This type of veil forms a halo around you and frames you — you can wear pretty much anything and look fabulous! Left to right: Oscars Amanda Garrett Gown, Rhinestone Hairpins, $54. Cathedral veils are the most regal and formal of the veils. Often, they’re so dramatic that they attract even more attention than the dress itself. This type of veil makes a definite statement and sets a feel for the bride’s style and tone. The veil typically extends at least one foot beyond the gown’s train, and it can even go on for more than five yards. Dress: You definitely can’t pair a veil that length with a short dress! Stick to the mermaids, trumpets, or ball gowns made of laces, silks, satins. 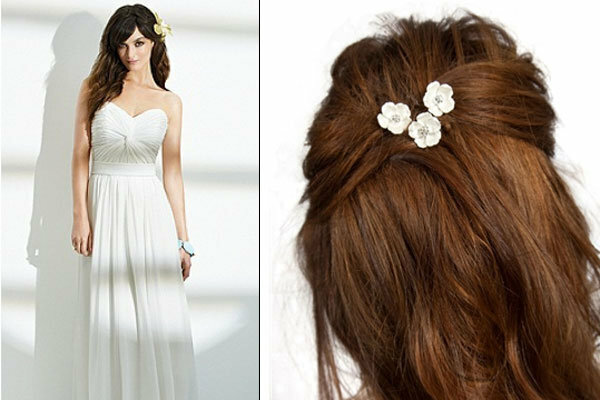 Accessories: Consider a hair adornment like a flower, jeweled hairpiece (not necessarily a tiara), or a headband. 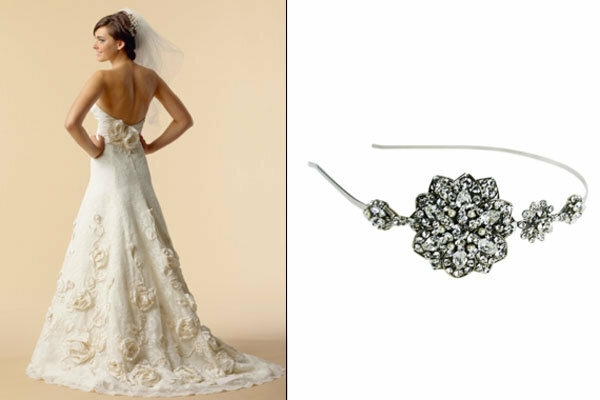 Left to right: Watters Victoria Gown, Garden Headband, $249. 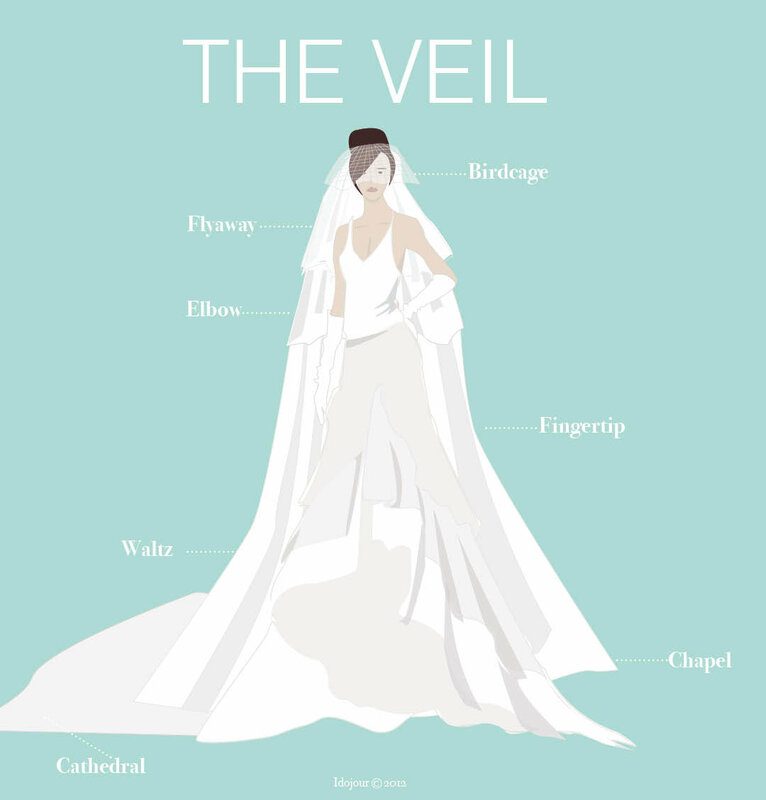 Tell us: Which type of veil will you be wearing? Previous story Did You See the Back of that Dress?